Description: Brown’s Creek State Trail, which opened in October 2014, is the latest addition to Minnesota’s extensive trail system. The rail-trail stretches from the St. Croix riverfront town of Stillwater to meet up with the popular Gateway State Trail in the town of Grant, thus becoming part of the expansive Willard Munger State Trail system. With this connection, trail users have direct access to the St. Croix River via off-road trails from the capital city of Saint Paul to Stillwater. Length: 5.9 miles out, 11.8 out and back. To access the tail in Stillwater from Saint Paul, take I-694 to Exit 52B. Merge onto MN 36E., andgo 8.5 miles. Turn left onto MN 95 N./St. Croix Trail. In 2 miles, parking will be on the left at Laurel St. the trail is adjacent to the parking lot. Midway on the trail, parking is available at Brown’s Creek Nature Preserve. From Saint Paul, take I-694 to Exit 52B. Merge onto MN 36 E., and go 5 miles. Turn left onto Manning Ave. N., and go 2.6 miles. Turn right onto McKusick Road N., and in 1 mile, turn right onto Neal Ave. N. Parking will be on the right in 0.1 mile. The trail is adjacent to the parking lot. To access the trail in Grant, from Saint Paul, take I -694 to Exit 52B. Merge onto MN 36 E., and go 0.5 mile. Take the exit toward Hiton Trail, and follow Hilton north 1.5 miles. Turn right onto Stillwater Road/75th St. N., and to 1.2 miles. Turn left onto Jamaca Ave. In 1.9 miles, turn right onto MN 96/Dellwood Road. Parking will be on the right near the trestle bridge at 1.4 miles. Follow the Gateway State Trail southwest 0.25 mile to reach Brown’s Creek State Trail. Difficulty: The smooth asphalt trail takes skaters through beautiful scenic views toward the Gateway Trail. The trail is very smooth with a slight uphill grade toward the Gateway Trail, down on a skate toward Stillwater. Due to the slight gradual slope, Skate Ventures rates the trail difficulty as a blue (two and one-half wheels) or beginner intermediate trail. Skaters should be able to use a heel brake down a steady mild decline. The emergency grass run or roll are helpful to all skaters, no matter the ability level. Usage: The number of users is mild to moderate. At this time, skaters will encounter bikers more often than skaters on Brown’s Creek State Trail. Surface Condition: Fresh smoothly paved asphalt makes for an excellent skating surface. Scenery: The paved route follows the former Minnesota Zephyr line that operated a dinner train along the route until 2008. Noted for its scenery, the route passes through woodlands along a 2-mile stretch of dedicated trout stream and through a mile long corridor alongside the St. Croix River, a National Scenic Riverway and Minnesota’s only river in the National Wild and Scenic Rivers System. The trail passes several historic sites. It also enables users to connect to local and regional parks and trails in the Stillwater area. Water: No water source is available while on Brown’s Creek State Trail. It is best to carry water or a sport drink during your skate. Hydration and electrolyte replacement is key during exercise. Skating Ability Recommendations: SV recommends proficiency in OSB Level 1-4, and trail skate classes. Skaters who can stop, start and turn with ease on flats and down moderate inclines are prepared for Brown’s Creek State Trail. Skate Ventures skills needed are, the defensive skate position, stabilizer, heel brake stop, heel pump stop, grass stop and modified trail stride. Fitness Recommendations: Skate Ventures skaters who can skate at least 6 miles on beginner intermediate trails with some ease. Trail Skate Class 2 prepares you for Brown’s Creek State Park Trail. 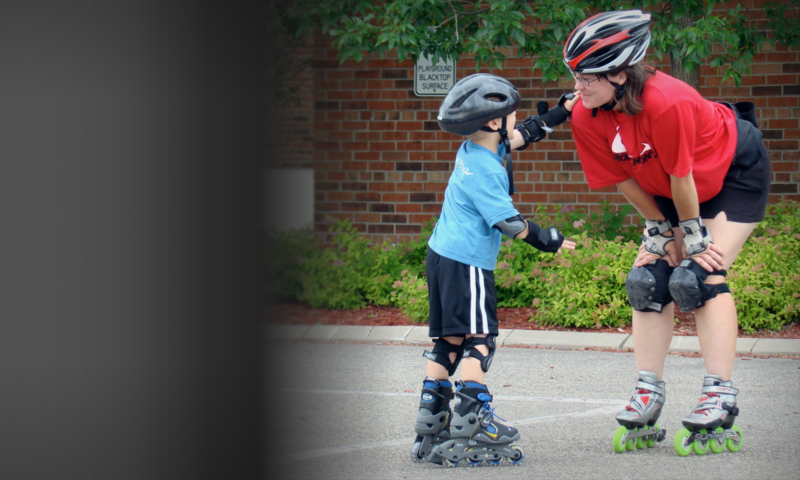 SV Lesson Meeting Location: SV skate instructors will alternate meeting locations depending on inline skate class objectives. First location is the parking lot on Laurel Street East downtown Stillwater, MN at the eastern end of the trail. The alternate location is Brown’s Creek Nature Preserve parking lot off of Neal Ave N.
Disclaimer: always skate with caution as skate surface conditions change from season to season due to weather changes.